Merriam Webster On-Line Dictionary defines “Archetype” as the original pattern or model of which all things of the same type are representations or copies. Now, I’m not saying other clubs or individuals don’t have excellent Fly-Ins. Neither am I saying they are “the original”. 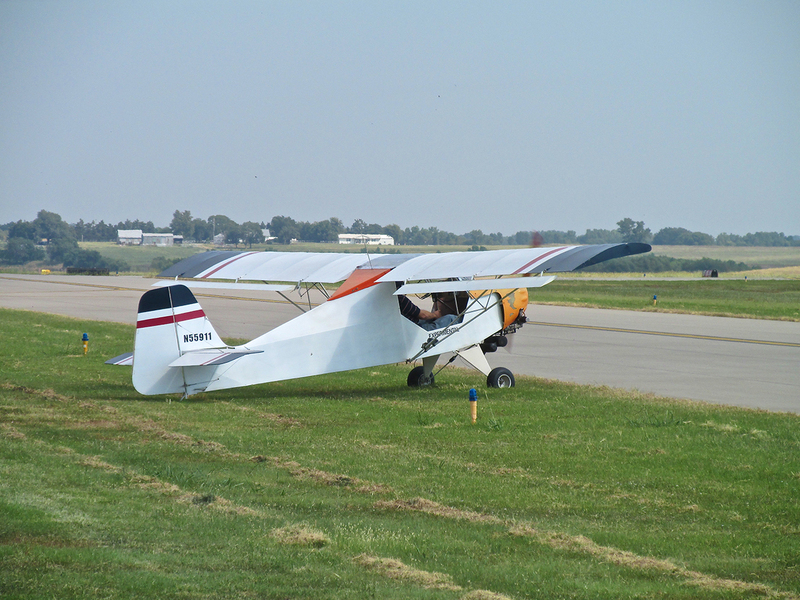 But, if you are staging your first Fly-In Event and want a template from which to proceed, you can’t do any better than to follow the example of the Monthly Fly-In at Ponca City Regional sponsored by The Ponca City Aviation Booster Club. 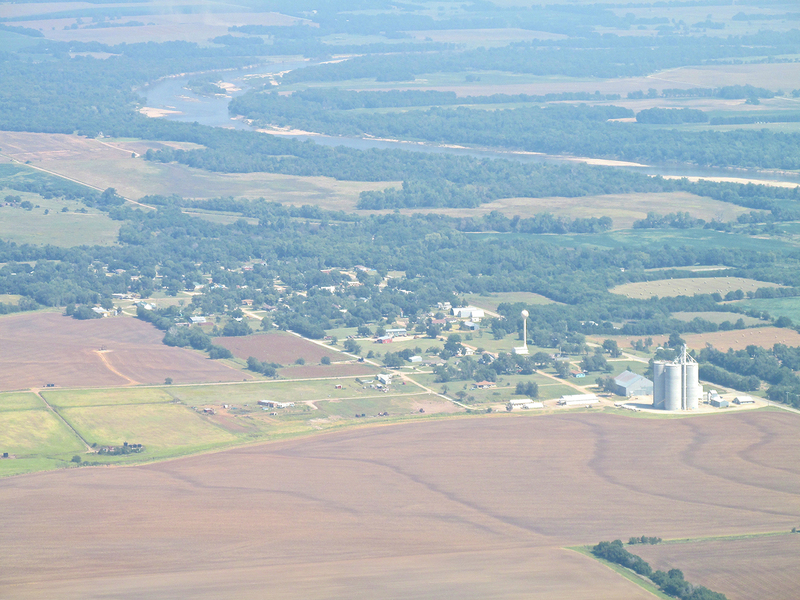 I was already familiar with The PCABC from a flight I made to Ponca City in August of 2012. That day I had the great fortune of meeting Club Members Dean & Pat Henson who were there that morning to do some cleaning up. They took me on a tour of The Club’s facility and I wrote a story about it you can see HERE. 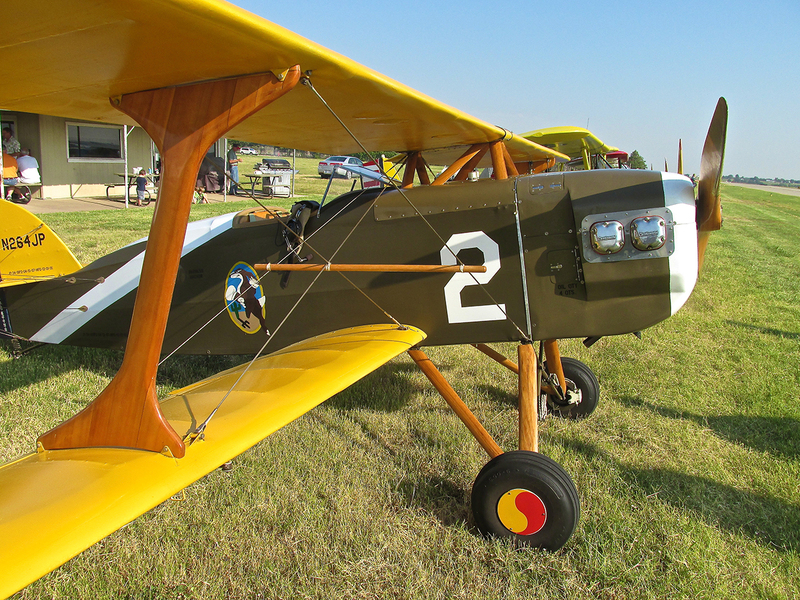 I had heard about The Monthly Ponca City Fly-In for decades. Everybody talked it up and said it was great. The only “negative” report I heard was from a guy who got there too late for breakfast (Now that I have had their breakfast, I can see why he was disappointed). In order not to miss the meal I determined to leave before Sunrise. 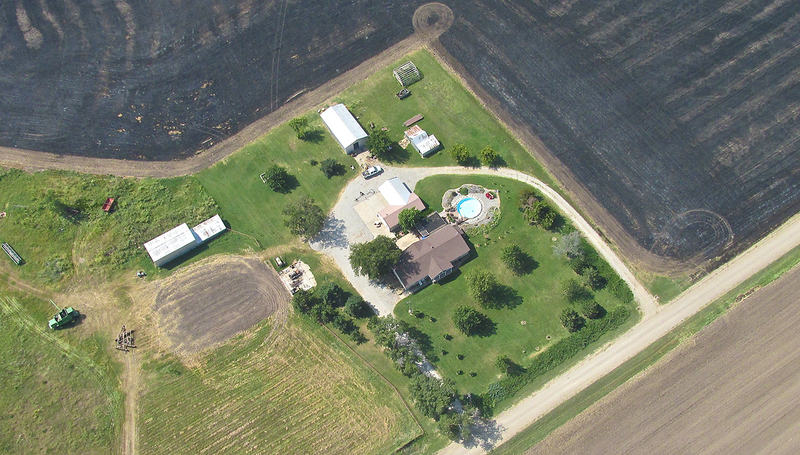 When heading South from my airfield I climb to 1,000′ AGL in order to pass over a number of homes that are in that area. The picture below is not very sharp but I’m using it to demonstrate the phenomenon described above. At this moment my Ultralight’s airspeed is 40 mph but because of the headwind at 1,000′ my ground speed is only 13.7 miles per hour! 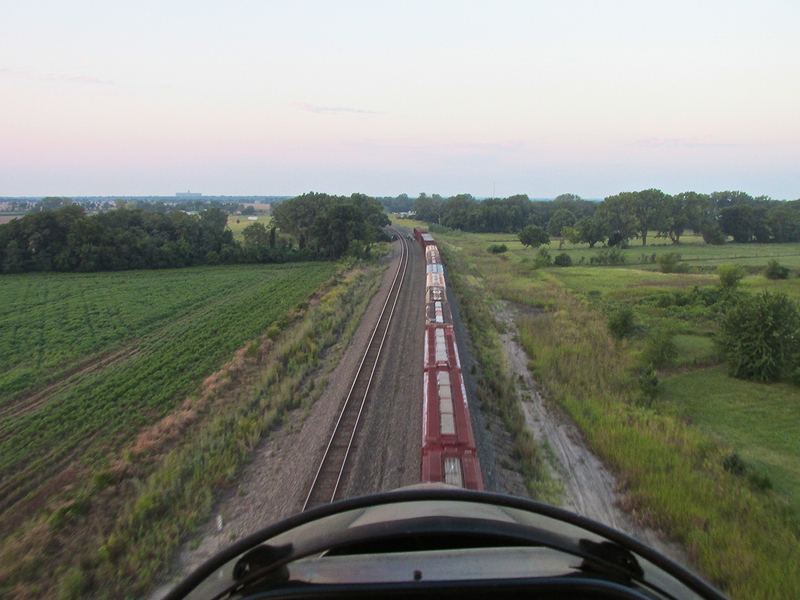 As soon as I passed over the houses, I dropped down to 75′ AGL (or lower) for the rest of the trip and was able to maintain 35 to 40 mph across the ground. 13 miles per hour… Kids on bikes can go faster than that! 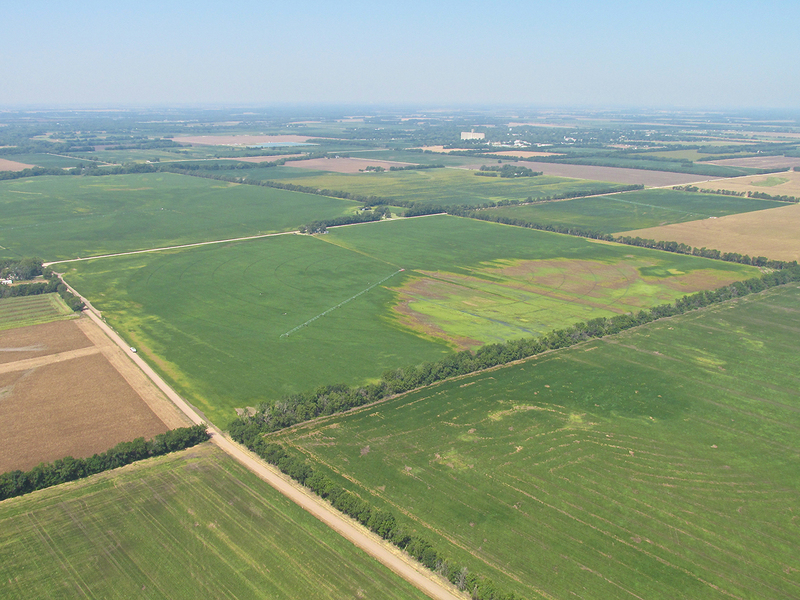 Even though Belle Plaine is in a rural setting, things don’t begin to really thin out until South of it. Here are some pictures of that area. Mere weeks ago this had been filled with water. Upon draining off it has left salt residue behind. As I popped up over a hedgerow I saw this storage building with a broken back. As the morning progresses, the sun heats the earth causing convection currents. At the same time, the wind aloft slowly drops to the surface of the earth. Both of these phenomena happened together rather early that morning and produced the requisite air turbulence. 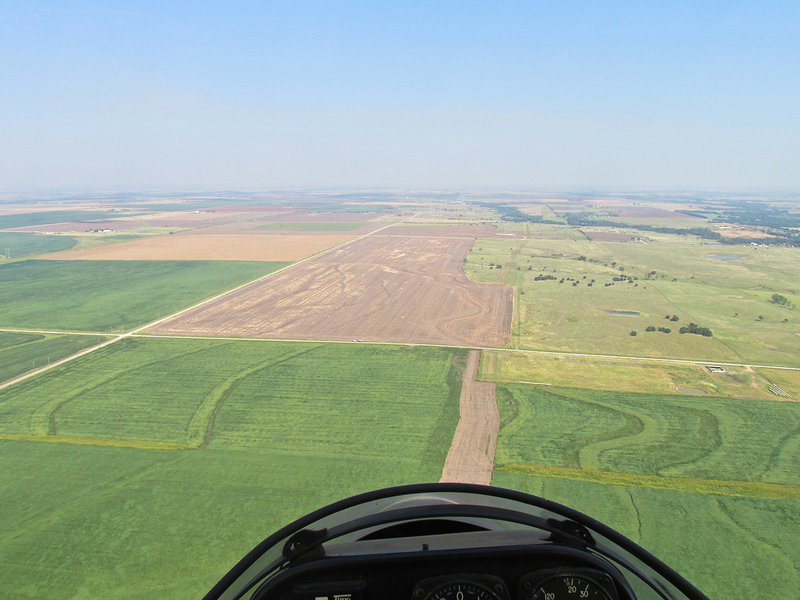 It was enough that I had to maintain “both hands on the wheel” for a majority of the flight to Ponca. This kept me from taking more pictures. Arriving near the field I took one last shot before entering the pattern. A beautiful morning such as it was would be sure to draw many fliers and I wanted to make sure I eased into the air traffic flow properly. I put my head in “swivel mode” and scoured the area for traffic as I entered downwind. 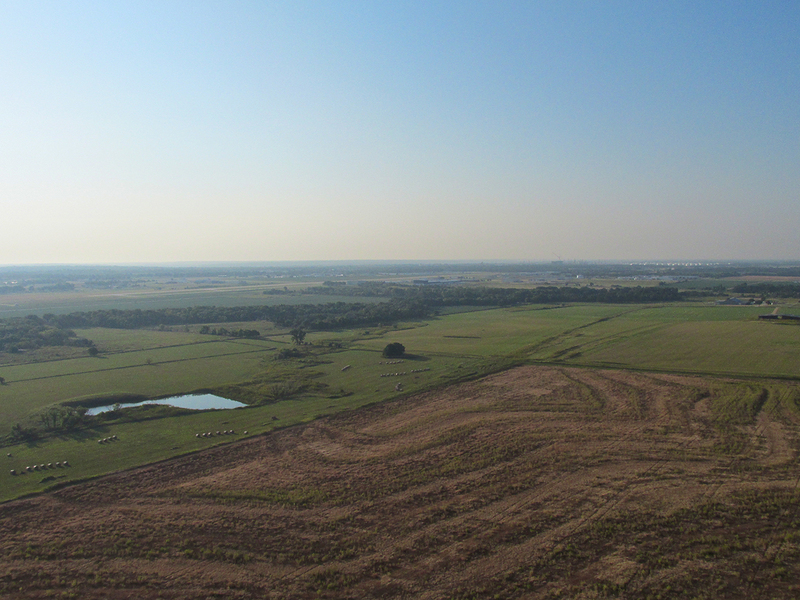 Through the haze you can see Ponca City Regional to the left and the huge tank farm on the photo horizon South of the airport. 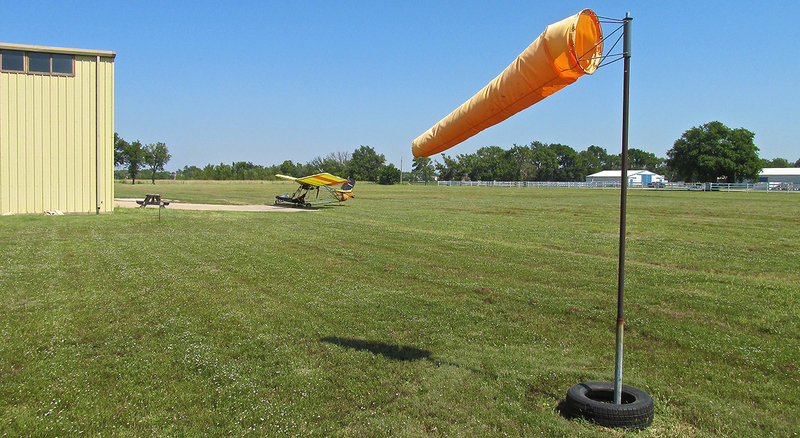 As I taxied off the active I beheld a near “Air Show” atmosphere. There were loads of folks walking about the flight line looking at planes, taking pictures and enjoying the magnificent morning. I tried to take some photos of this action while taxing but frankly it didn’t work out too well. At the moment I had a “Follow Me” cart driver asking me where I wanted to park as well as “throttle and brake” chores to handle with my hands. Sometimes The Sky Surfer has to drop the camera and control the plane… Regardless, the one picture I did grab gives you a feel for that morning’s Fly-In Atmosphere. I found a primo spot on the grass right in front of The Club’s building. I pulled up and immediately set to securing my plane. It wasn’t all that windy but it is best to safety the MXL before you need to. I have a pack above my seat back containing metal stakes, adjustable straps and a hammer. The hammer might seem out of place, but after numerous times searching for a suitable rock or attempting the “stomp method”, inserting stakes with a hammer is the only way to really get it done. 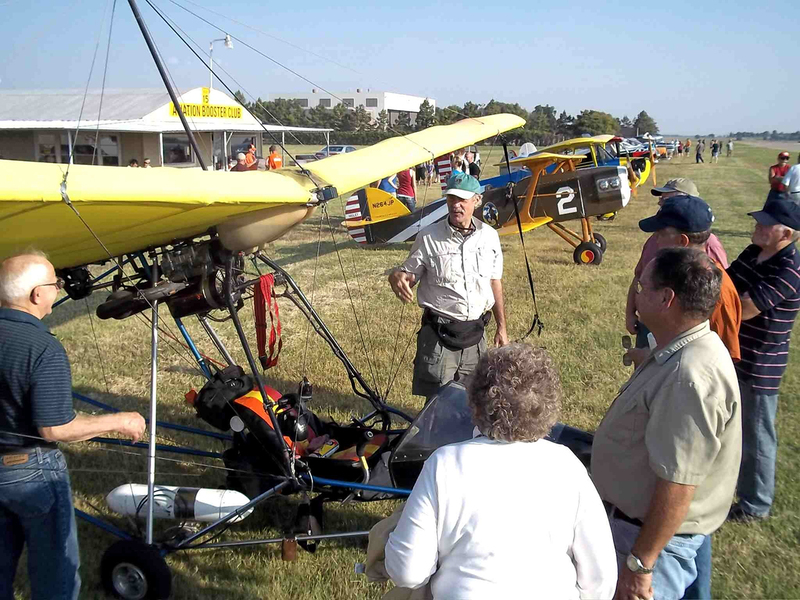 While hustling around the Ultralight getting it secured, I was besieged with questions from townspeople and pilots alike. Right up there with flying and writing about his exploits, The Sky Surfer relishes an opportunity to ‘hold forth’ in a venu such as this. Non-pilots were amazed a thing like my Quicksilver MXL could fly. Pilots were impressed I could fly it such a distance. One of the new friends I made that day was Floyd Cook. 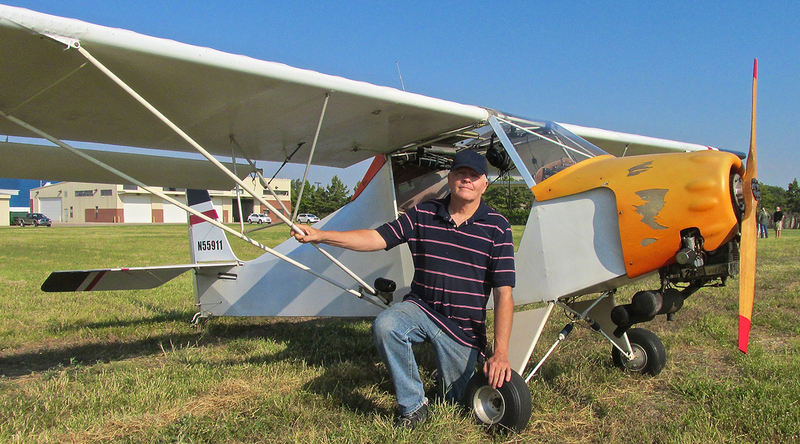 Floyd was very interested in my plane and The Flite Blog™. Among many things he and I share in common is Conservative Political Values. Floyd is deeply involved in the Kay County Republican Party. He took the picture below of me regaling the assembled masses with tales of derring do (fanciful or true…) and was kind enough to send it to me and allow it to be used in this report. As I did my best to answer questions in the crowd I saw a familiar face. It was Jerry Jackson. 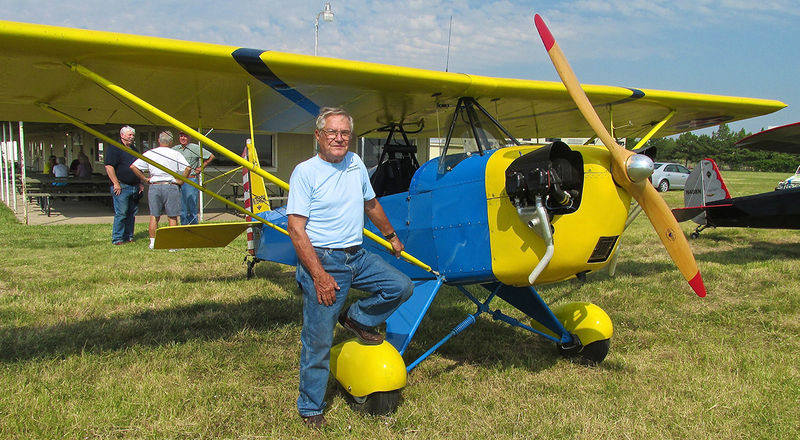 I had met Jerry at the Hominy Airport when I made a flight there at the end of the 2012 Flying Season. I wrote about the trip HERE. 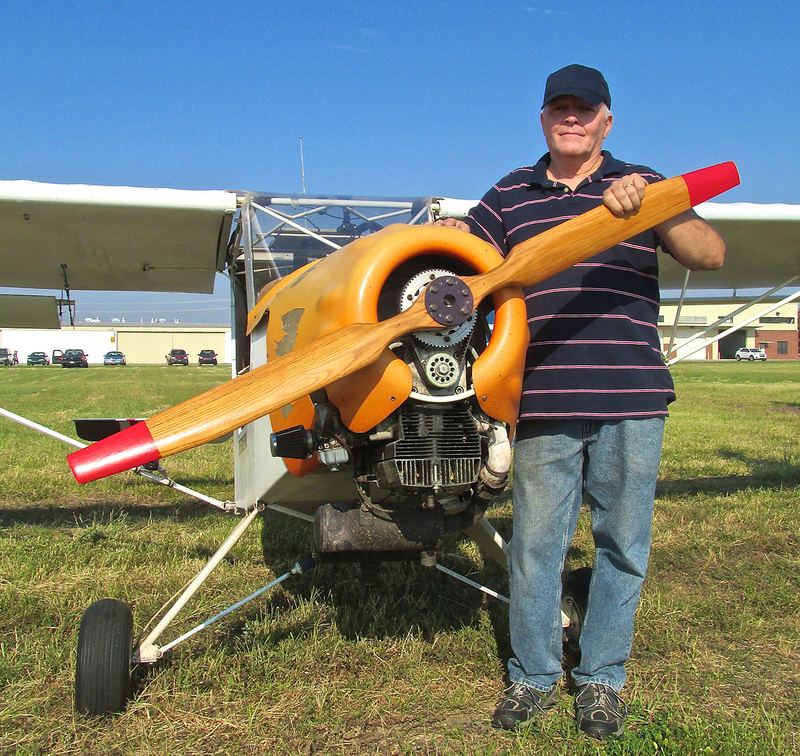 That day he was replacing a bearing in the nose wheel of his Classic 1946 Ercoupe. I asked Jerry if he had flown it in and he said, “Yes!”. 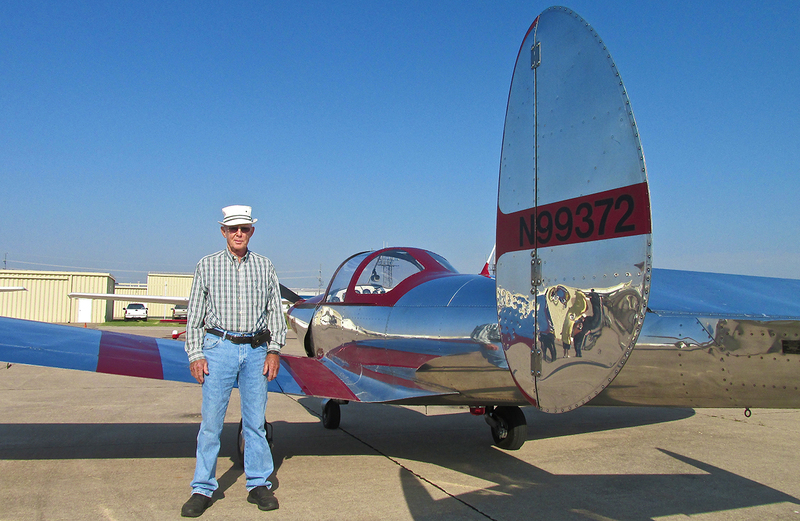 It was time for me to get away from my plane to take some pictures of Jerry’s fine Ercoupe and the other attendees. The Ercoupe would be Plane #1. A group ponders the merits of The Sky Surfer’s ride. In addition to proximity to The Club Building, another reason I parked my plane where I did was to bask in the glory of the “SPAD-like” Wolf W-11 Boredom Fighter seen below. It’s a design I had not seen one before and I like it a lot. My skill in aircraft building and repair is limited to hooking aluminum tubes together with AN hardware so I am impressed when someone can craft wood to this degree of excellence. I was not able to meet the owner. In 1928, Orland G. Corben released plans for what he called “The First Homebuilt Airplane”. This is the one Merle Helt built. It is called a Baby Ace. We will meet Merle later in the report. Stan is another new friend I have met in my Fun Flying. 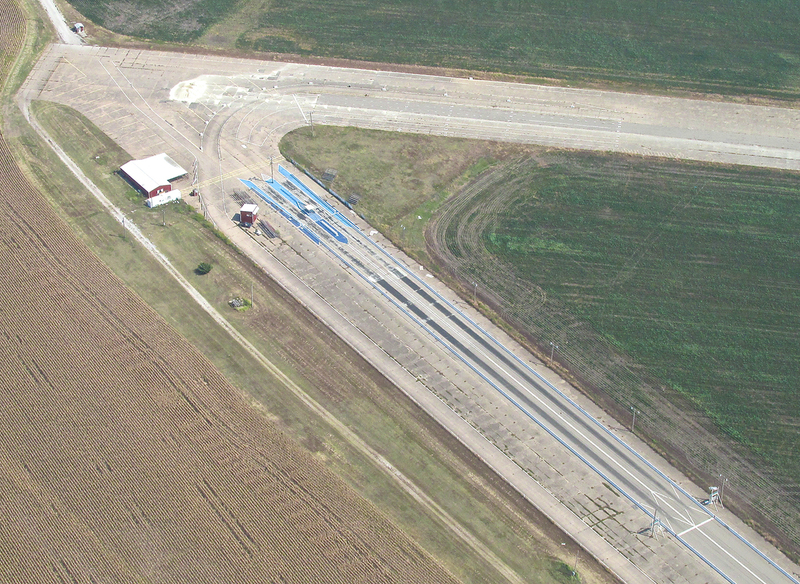 He has his own runway next to his home in Stillwater. 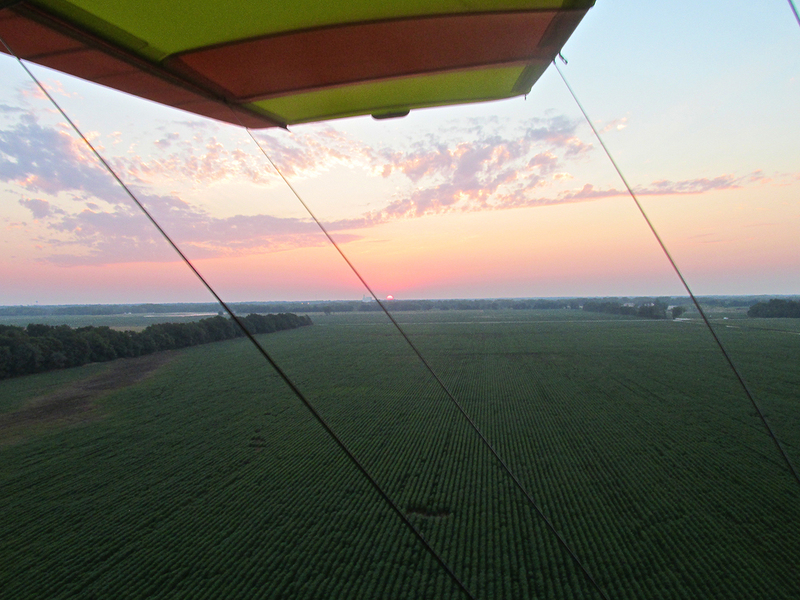 Like me, Stan enjoys the “low and slow” of Ultralight flying and he’s not afraid to get out of the pattern and venture. 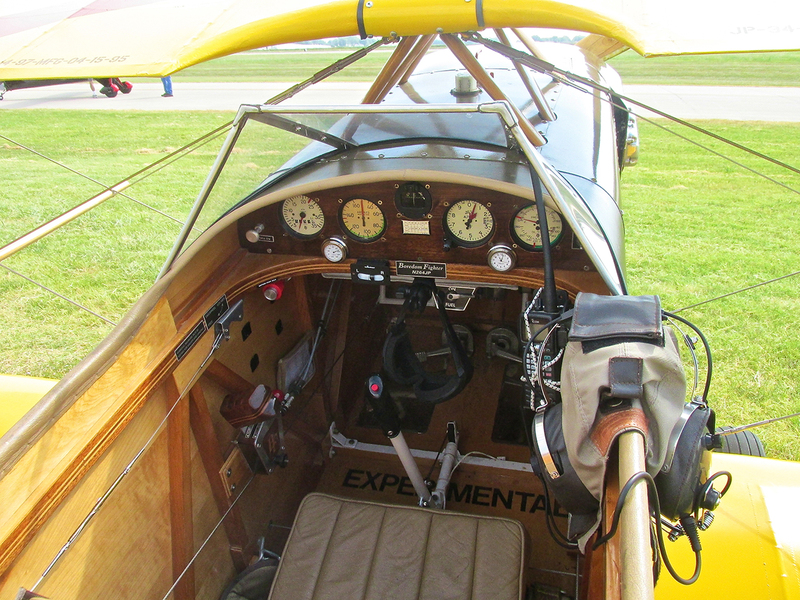 Because of some modifications he made to his Kitfox Lite that added significant weight, Stan decided to move it into the Experimental Category. I have added Stan’s place to my list of Fun Flights for next year. Note the video camera on Stan’s right wing strut. The Lite is powered by a 2si Motor (Two Stroke International). I believe Stan said it was the 430 model. As Stan and I walked about the airfield taking pictures and discussing airplane stuff it occurred to me that we might miss the breakfast. So we put the field tour on hold and hustled into The Club’s Dining Area. We were in the final group to be served. 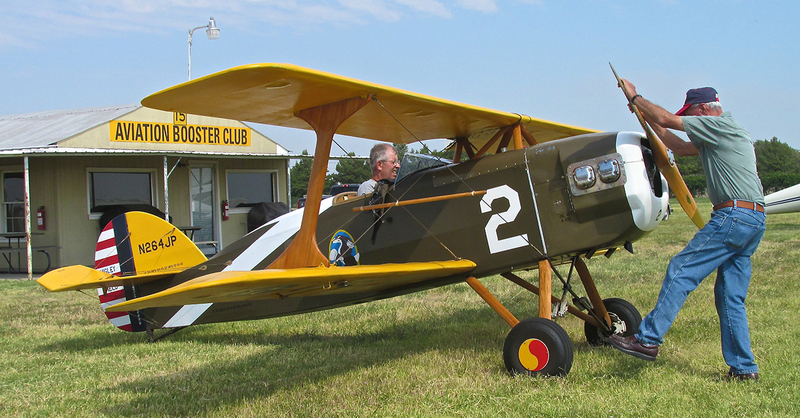 The breakfast served by The Ponca City Aviation Booster Club is not your average Fly-In Fare. 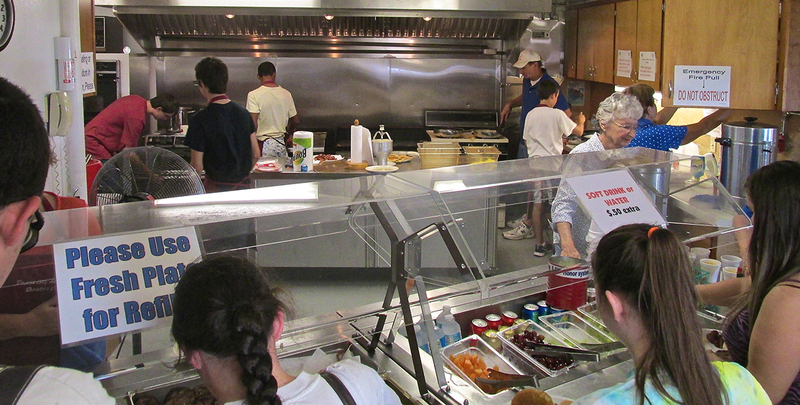 Their kitchen is equipped like a restaurant and I suspect the volunteers cooking the food are from the professional sector. 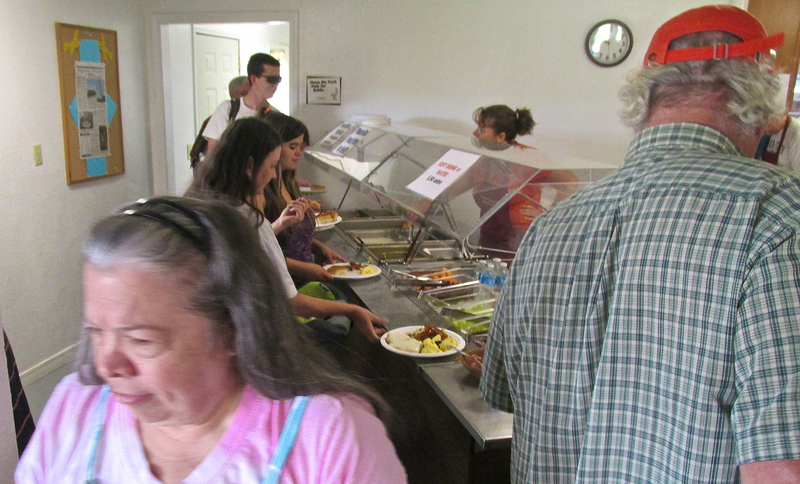 Everything tasted great and the value for the money paid is exceptional. 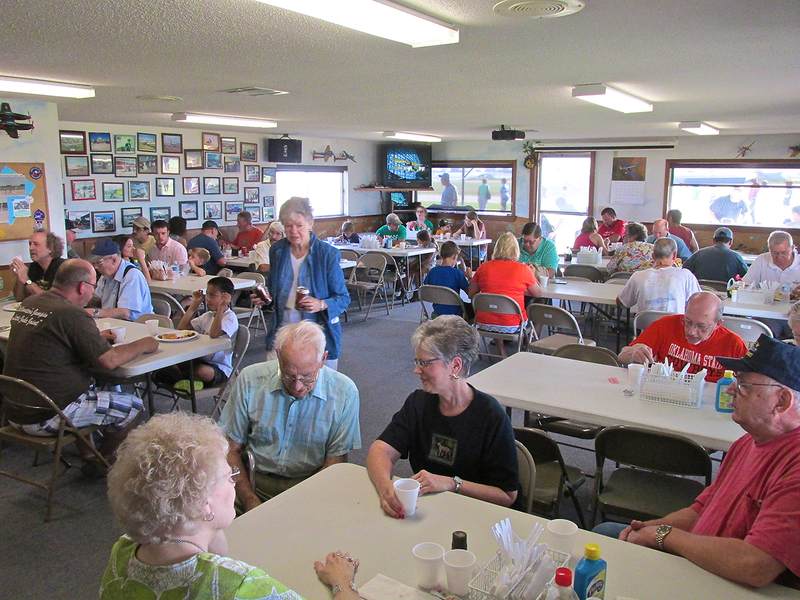 Club Co-President Merle Helt told me the profit they make from the monthly breakfast goes to support their annual Youth Aviator Camp. You can read about The Camp HERE. The place to be on a Saturday Morning in Ponca. It was late enough in the morning that Stan and I closed the restaurant. People and planes were beginning to leave. As we stepped outside I grabbed the picture of a Cessna Citation taxiing past my MXL. Citations are built in Wichita, Kansas. As Stan and I watched the Citation taxi by he saw someone he wanted me to meet. I was introduced to Merle Helt. Merle is very active in The Booster Club and currently shares the Presidency. I had shown his Fly Baby earlier but here we see it with Pilot/Builder Merle Helt. Stan had said Goodbye. I caught this shot of him moving to the taxiway for departure. The Boredom Fighter was getting propped before taking to the wild blue. After removing and stowing my tie downs and topping off my fuel tank, I looked around and everyone was gone! I decided it meant it was time for me to leave also. After takeoff I snapped a few pictures of the Airport. 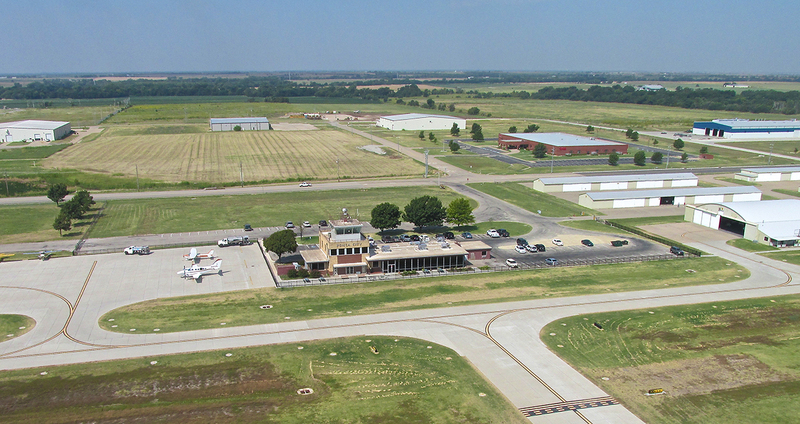 The Ponca City Regional Airport Terminal. Enrique’s Restaurant is inside the terminal and reputed to be excellent. I saw this rig on the ramp. 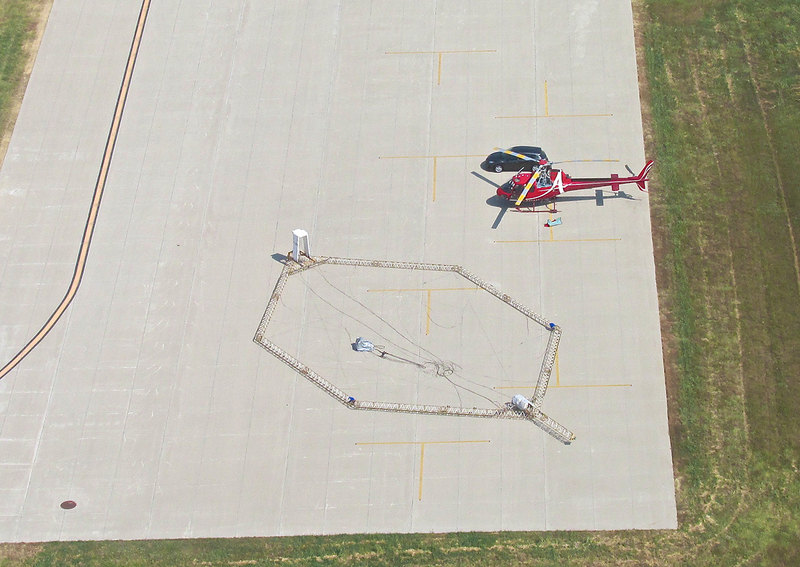 I’m thinking it is carried by the helicopter and is some type of oil or pipeline searching device. Anybody know? 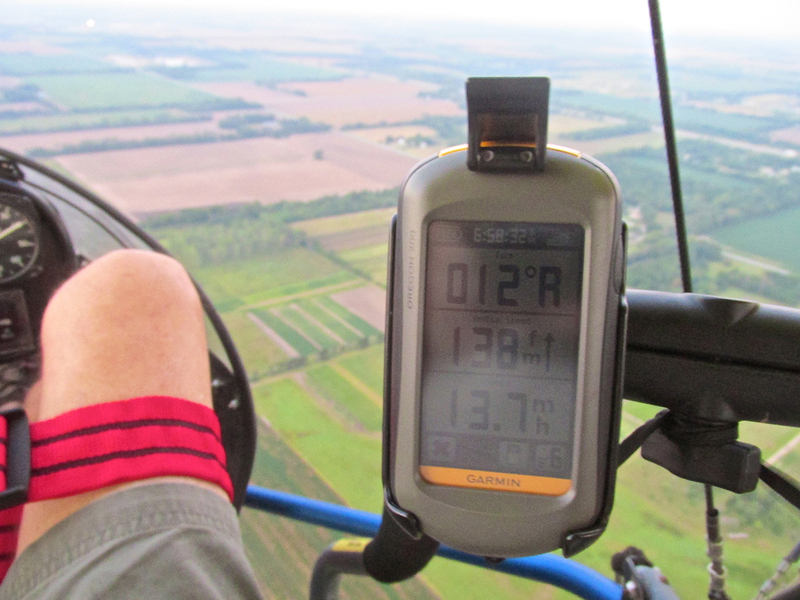 The surface wind was negligible but at 1,500′ AGL I picked up a good breeze from the South. The temperature was perfect there and the air was the smoothest so I stayed between 1-2,500′ AGL for the trip North to my home strip, Selby Aerodrome. 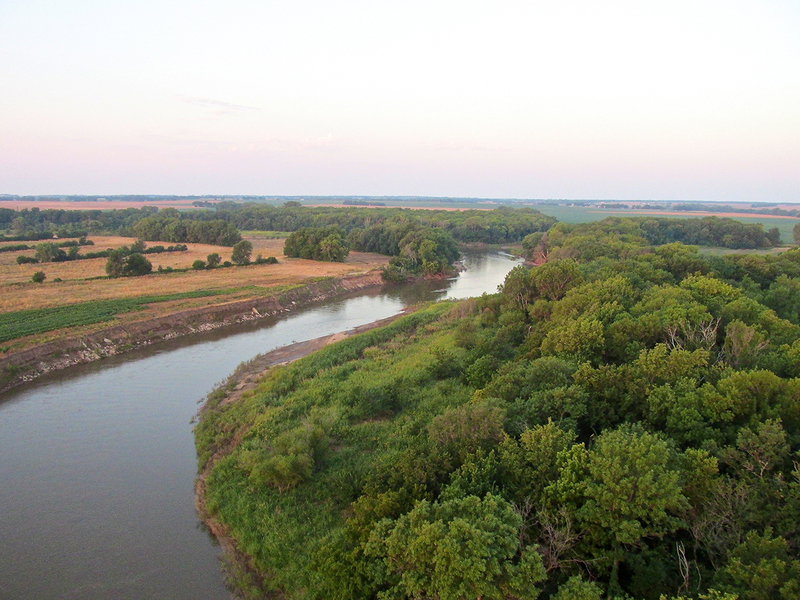 The view North 2 minutes after leaving the Ponca Pattern. I am at 1,000′ AGL. That is a Perfect Burn. 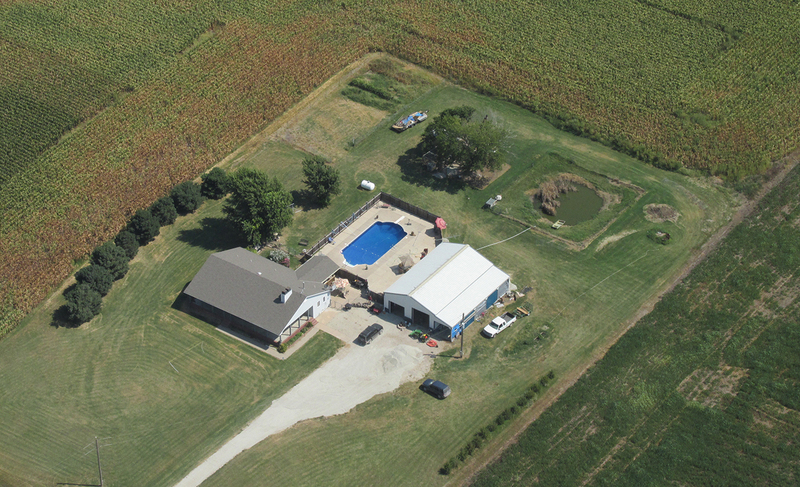 The owners of the field have a nice spread complete with swimming pool. I have crossed the border to Kansas. 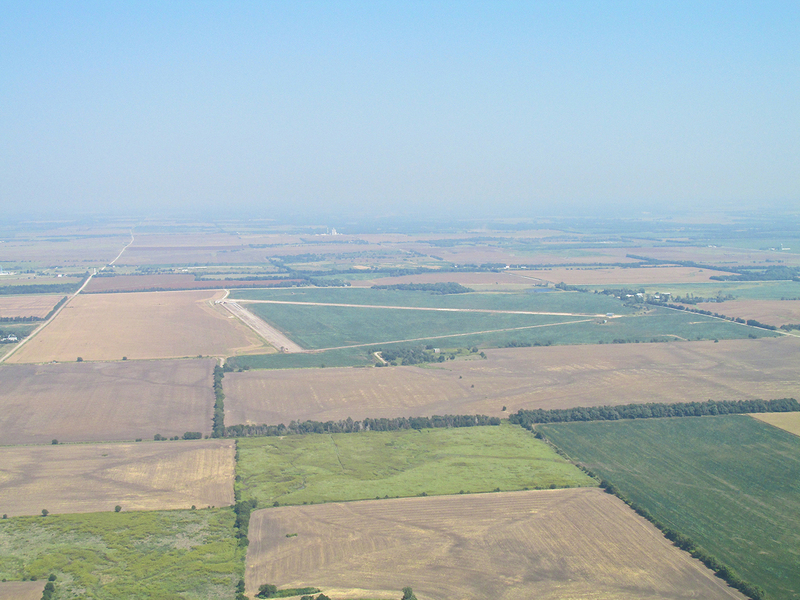 This is The Flatland. The air was a bit hazy but everything was bright. 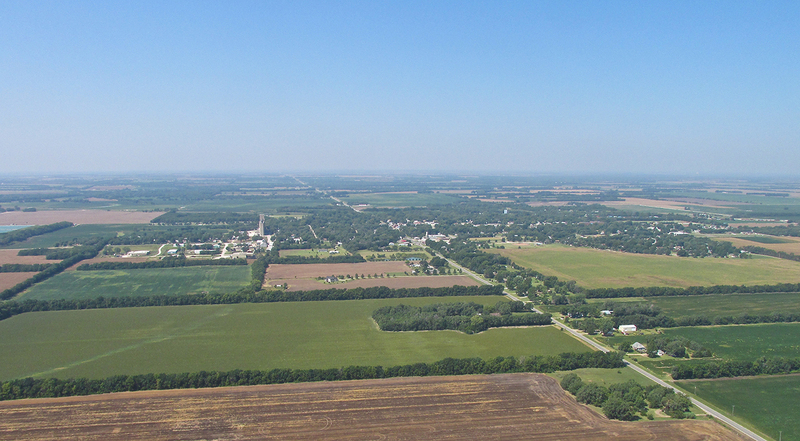 From 1,700′ AGL looking Northwest. 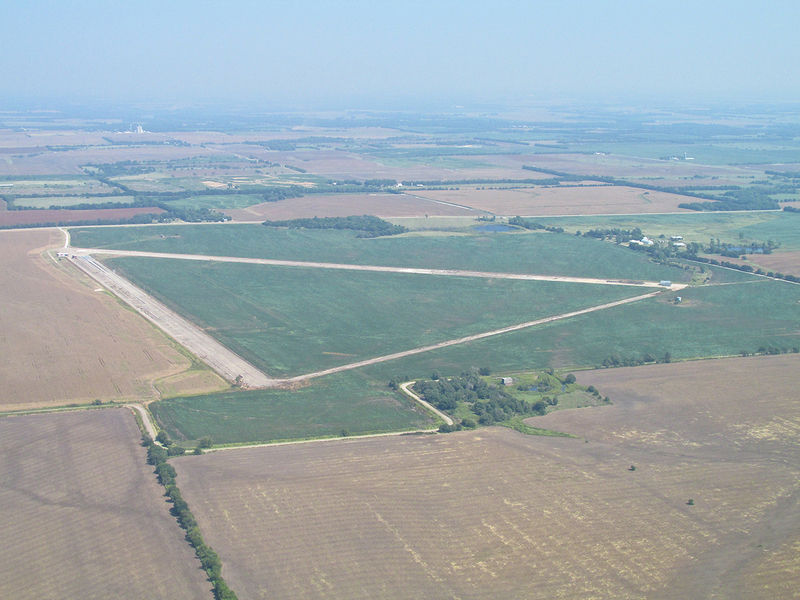 Also known as Strother South Auxiliary Army Airfield #5, this airfield was part of the enormous buildup of pilot training bases in Kansas during World War II. I have flown over and near it many times. I drove there once in order to shoot video of a Drag Race. You can see the music video I produced from that shoot HERE. I call it “What A Drag”. 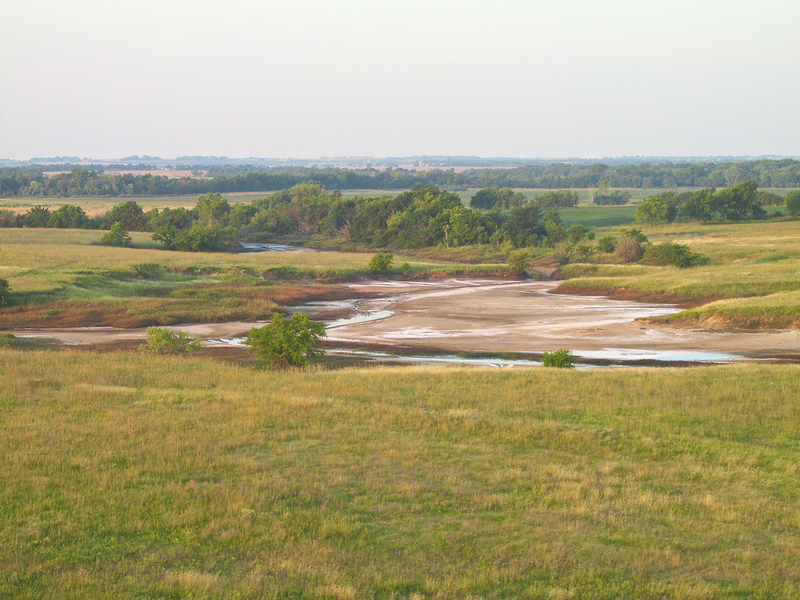 Seven miles Northwest of Arkansas City, Kansas is Geuda Springs. 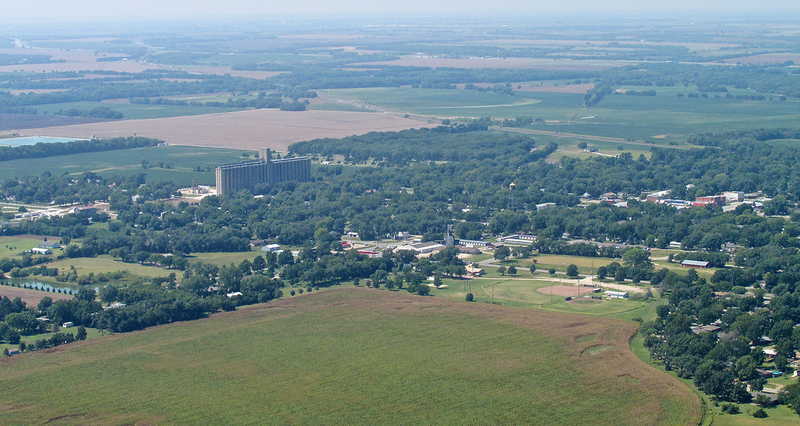 I have never been to this town but will next flying season. I just read that there are a number of fast producing Salt Springs there. NOW I know why I see the salt flats around there! A little closer… Wider Angle. 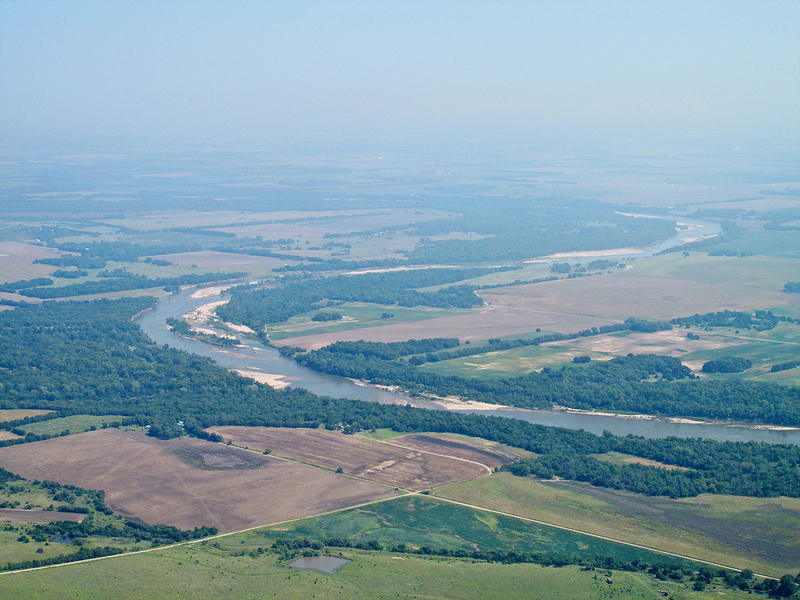 The Arkansas River curving about North of Geuda Springs, Kansas. 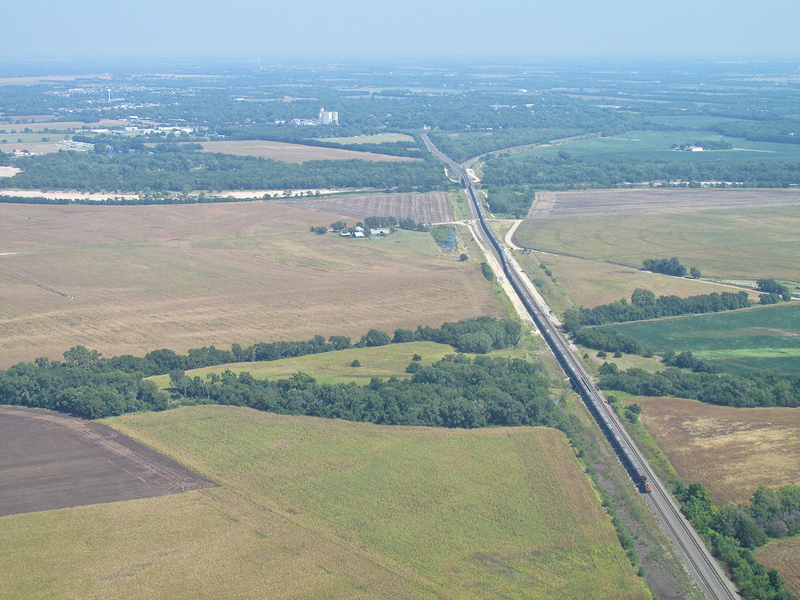 1,800′ AGL looking East Northeast. Now that I know about the Salt Springs near Geuda Springs, this next area makes sense to me. I have passed over it many times. 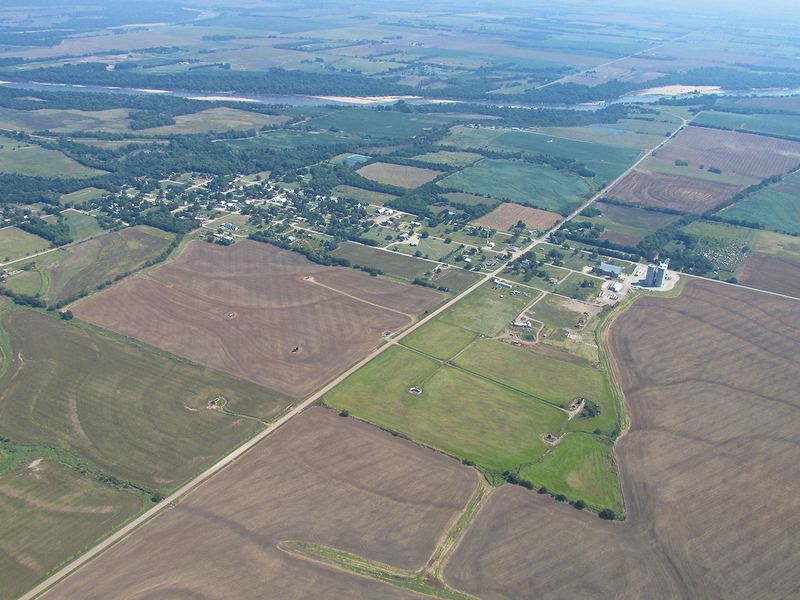 It is 3 miles Northwest of Geuda. 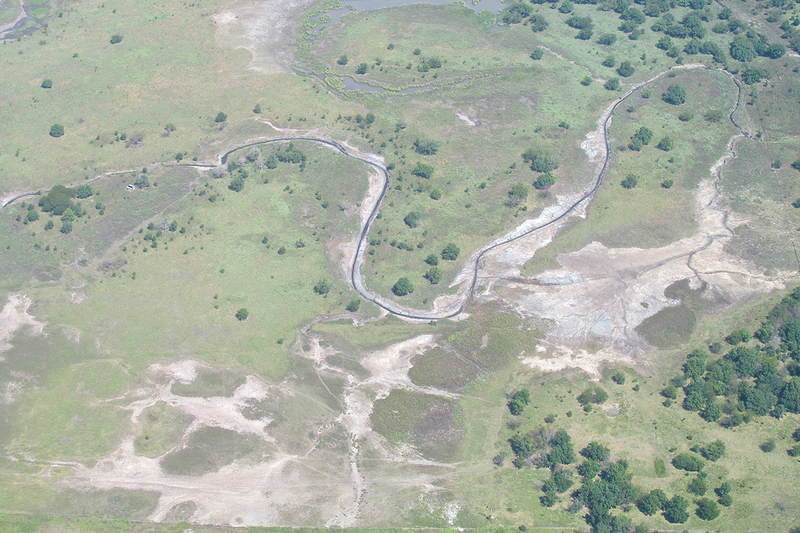 In 2011 and 2012 during the drought, it was completely dry. 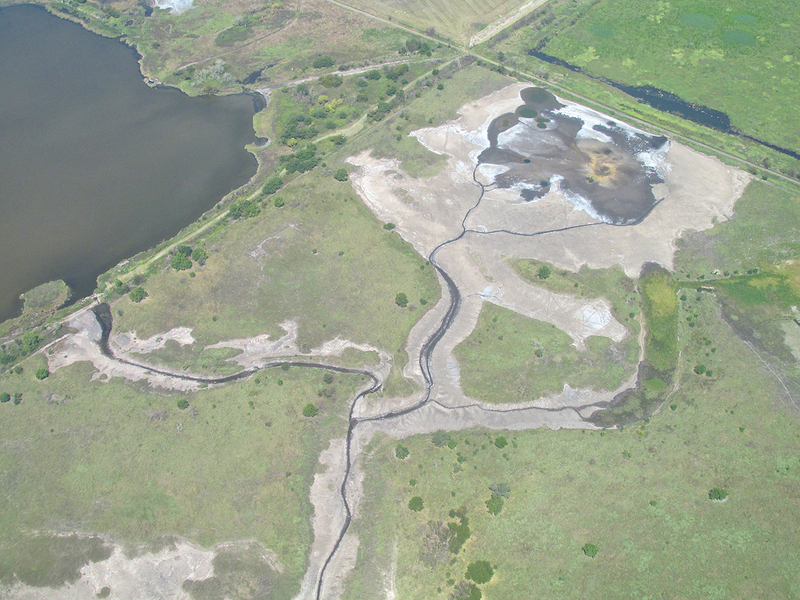 Now that rain has returned to the area, there is standing water but it is obviously high salt content. 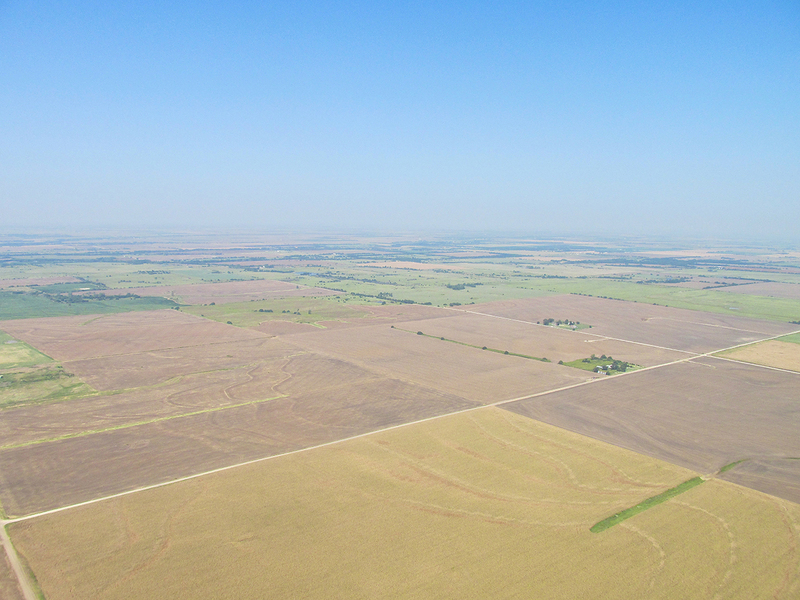 I took these pictures from 1,800′ AGL. 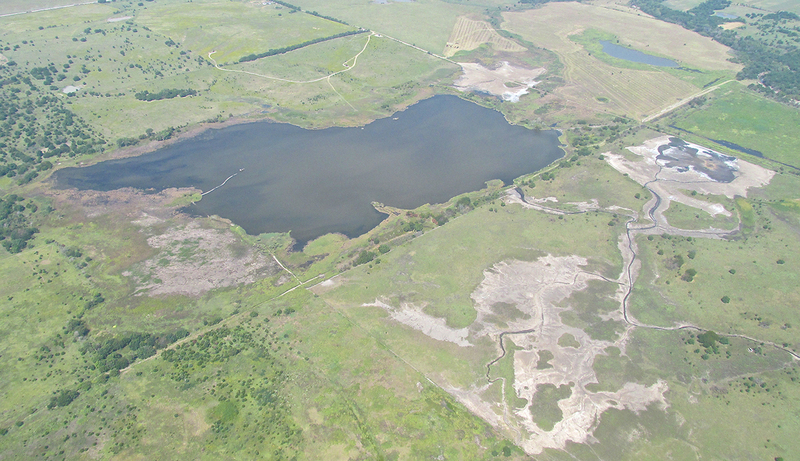 A wide shot of the entire area. 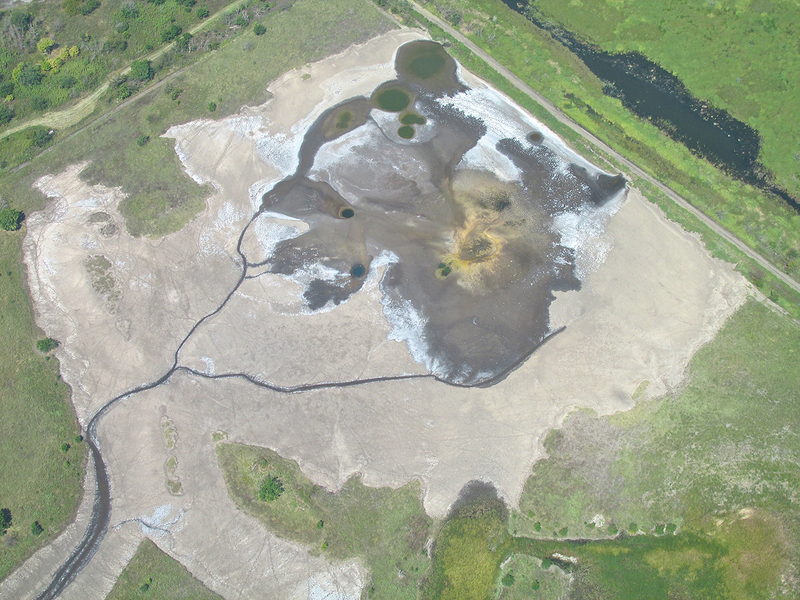 The dark creek running through the salt area looks as if cut into the surface with excavation tools. 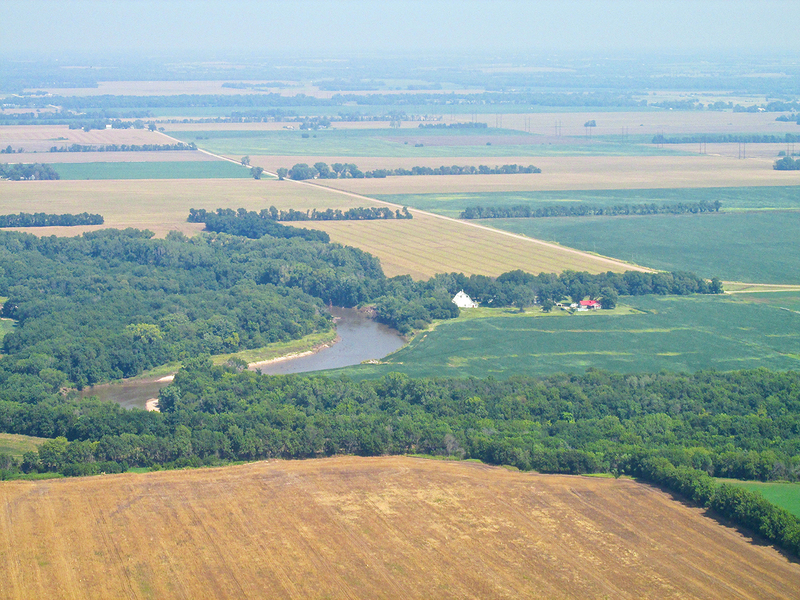 A bit farther North I noticed this habitation off by its lonesome nestled next to the river. …but they have a nice pool to cool off on a hot day like it was! 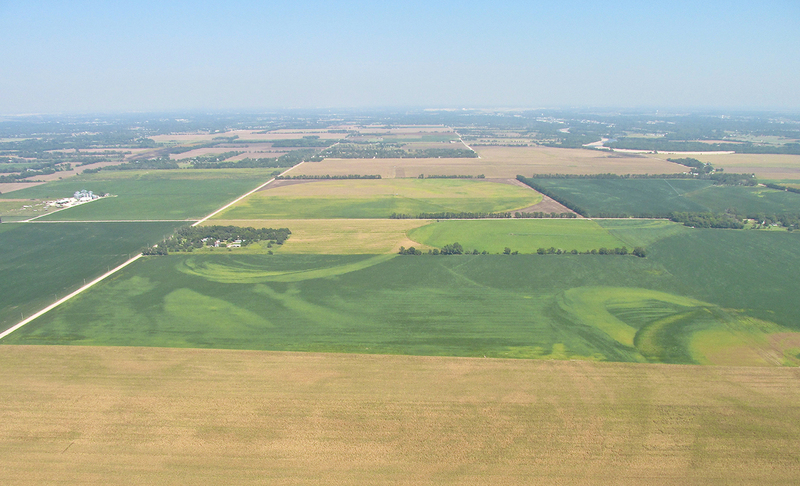 Southeast of Belle Plaine, Kansas, I noticed another field with about a third damaged. 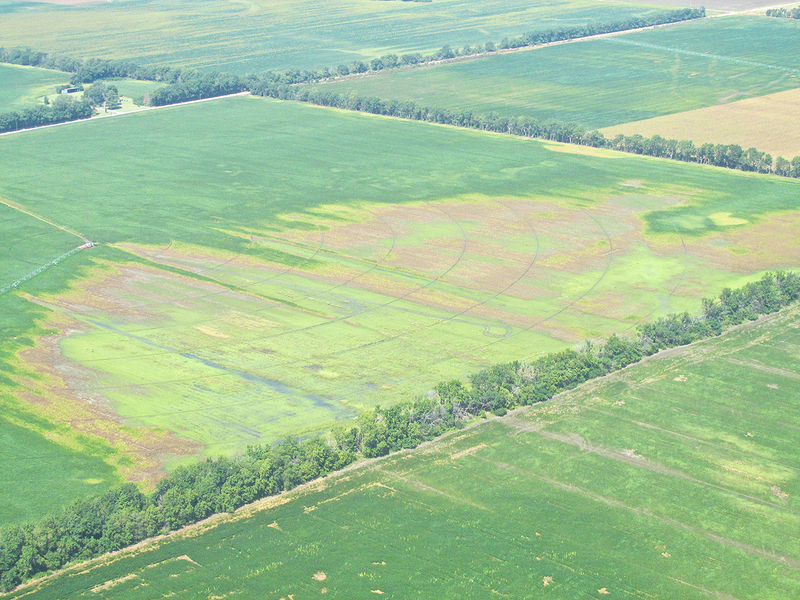 Because of the standing water still evident in the damaged area, I suspect the crop suffered from too much rain. 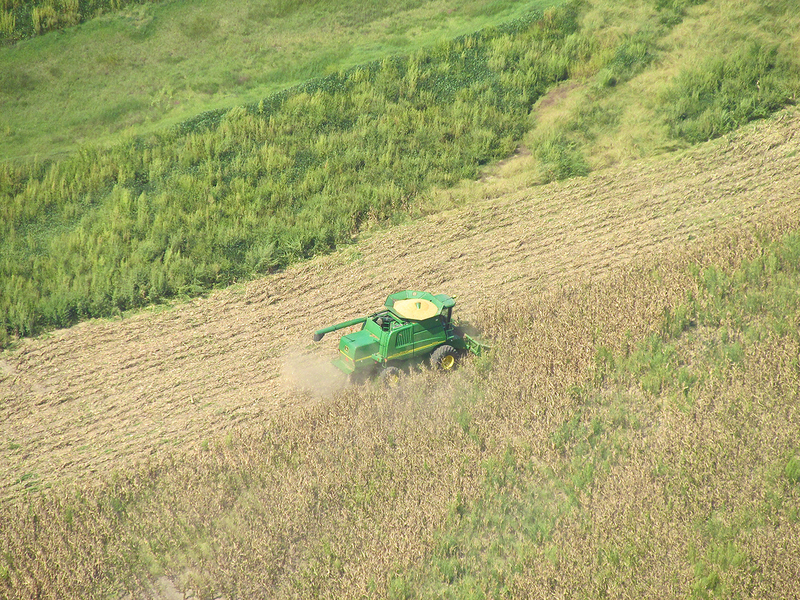 On the home stretch to Selby Aerodrome I see these patterns in the crops. 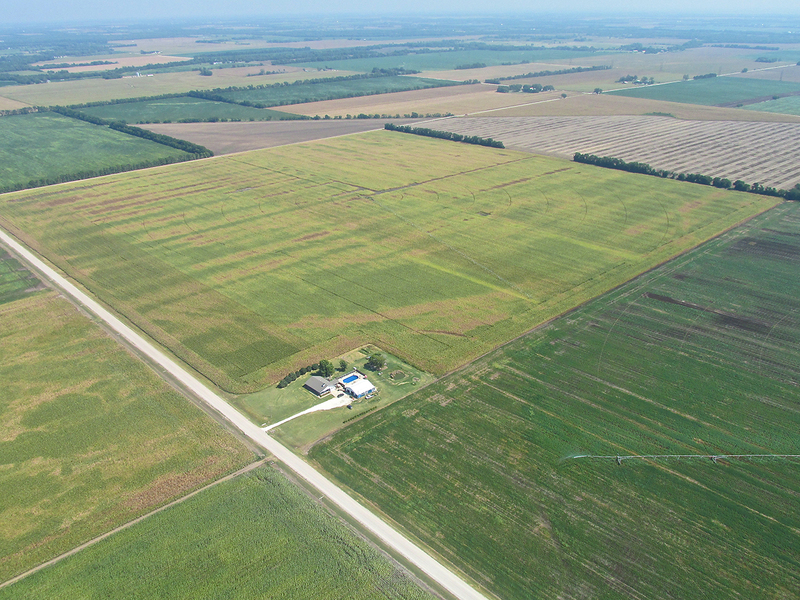 I believe this reveals the water retention capability of the different soils in these fields. Standing water hurts the roots and I think that is what happened in the yellow areas. I have been trying to get a shot like this for a long time. 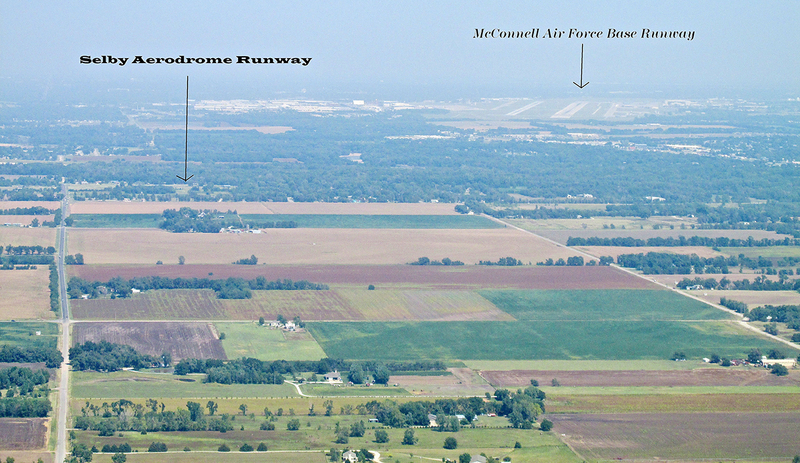 In it we can see both airfields and their proximity. 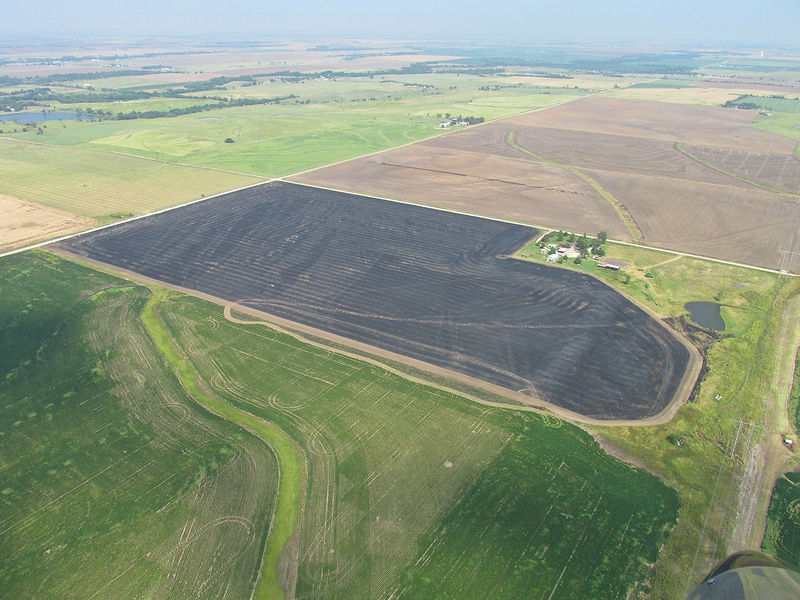 The photo was taken about 10 miles South of Selby at 1,800′ AGL. Good tailwind assistance all the way home. The wind sock tells the story. I had a good morning at the Fly-In. 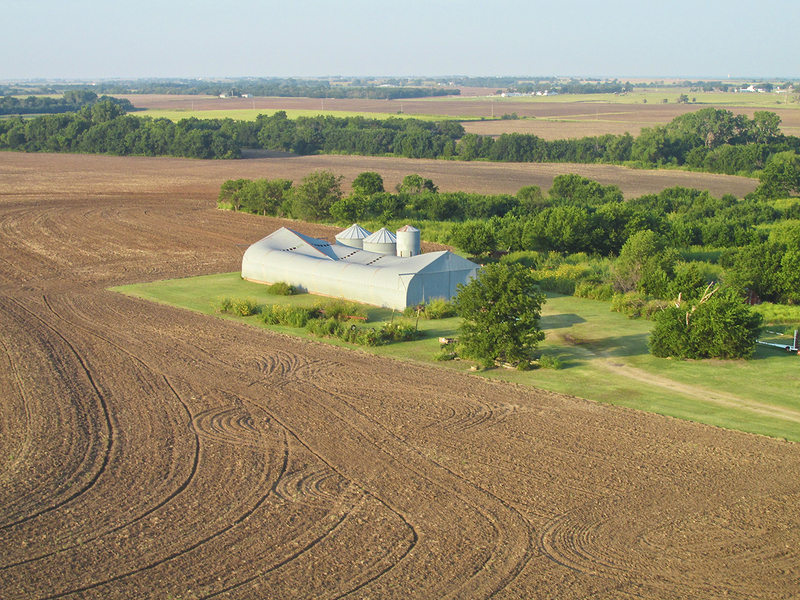 If you live in the region, I suggest you to fly to Ponca any first Saturday of the Month – for The PCABC Fly-In. You will like it.